There is a growing market for air fryers, and with a growing market,comes more choices. Here we are focusing on the available sizes and capacities of air fryers available today. The smallest air fryer we are aware of on sale is the Tatung TOT-F1300U at just 1.7QT. At almost $150 the Tatung is hardly cheap. It does however seem to gain good reviews. Maybe if you’re tight on space, but just can’t live without an air fryer, then this could be the model for you. However, at this price point it’s hard to look past the top customer rated air fryer on Amazon, the Aigerek ARK-100 , and at almost double the size, 3.2l, it seems to be much better value. Now, at the larger end of the scale, before getting into commercial air fryers is the big by name, big by capacity Big Boss Oil-less Air Fryer , coming in at 16QT. We suspect you’d be able to cook something like our One Basket Fish & Chips recipe for a family of 4 in here with little problem, and that’s an obvious advantage over smaller fryers. 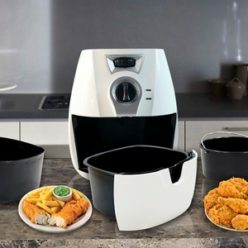 On the downside though is its requirement for counter space, as some reviews have pointed out, so if space is hard to come by, maybe compromising with the highly rated Power Air Fryer XL (5.3 QT, Black) is your best option. All in the Big Boss Oil-less Air Fryer at under $70 is great value. The most popular sizes for an air fryer seem to fall in the 3.4QT to 6QT range, with most of the big brands represented in this range. Our favorite is the Philips XL Airfryer , but it is pricey. So our best bang for your buck air fryer in this size range is the Della XL . Most accessories are designed to be used with the capacity of air fryer, such as this universal accessories package . If you have any recommendations for other users, please make a comment at the bottom of the page.